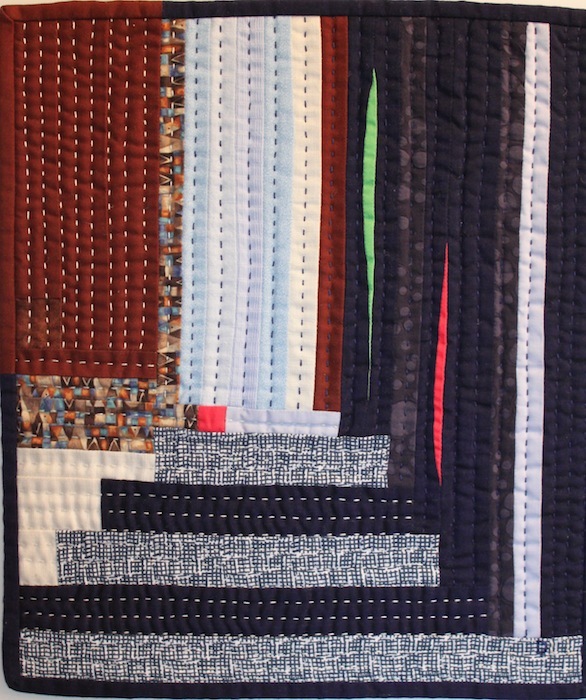 My quilt for the Yorkshire Rose Quilter’s Guild of Toronto president’s challenge is a reference to the best-selling jazz record recorded by Miles Davis: Kind of Blue. This year, the president asked the members to create a 12 x 12 inch quilt based on a song or song title. The quilt could be made with any technique, with or without embellishments. 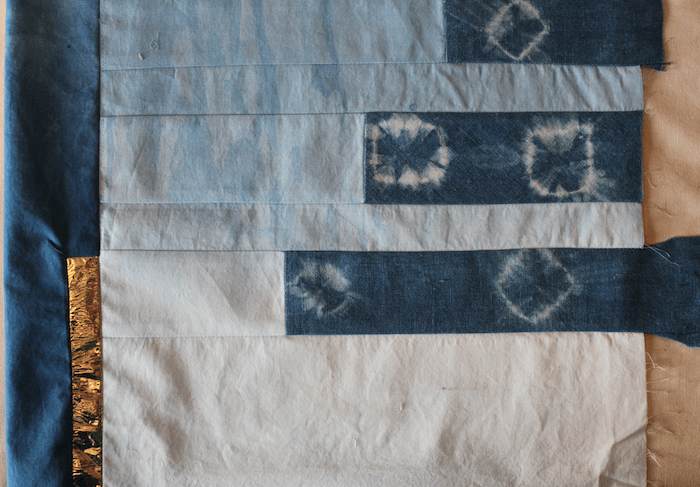 I pieced the top using my hand dyed indigo fabrics. 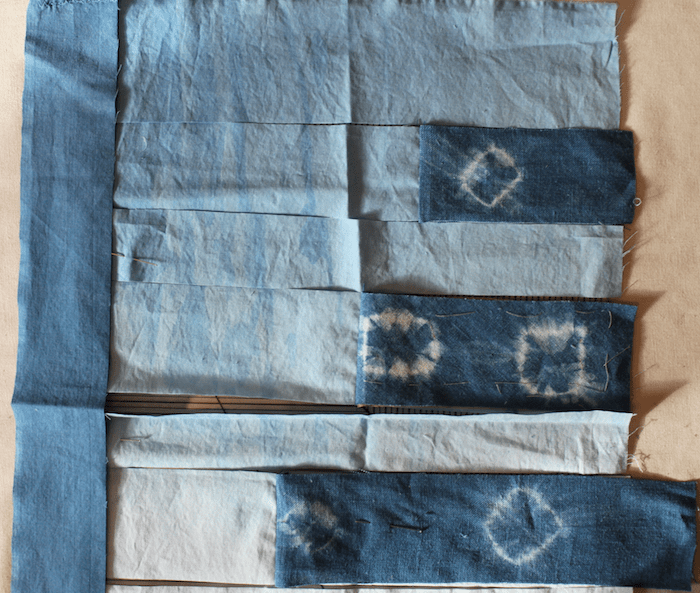 The nui shibori strips were fussy cut from a piece of indigo linen that I dyed in the summer, while the rest is cotton. I added a hint of gold to reference the trumpet that Miles Davis plays. The quilt top was heavily quilted with straight lines using a walking foot. Kind of Blue is a great album that contains a couple of songs with blue in the title including: Blue in Green and All blues. What’s your favourite song? Not Quite President’s Challenge Winner! I’ve been planning the quilt for The Not Quite President’s Challenge for a couple of months. 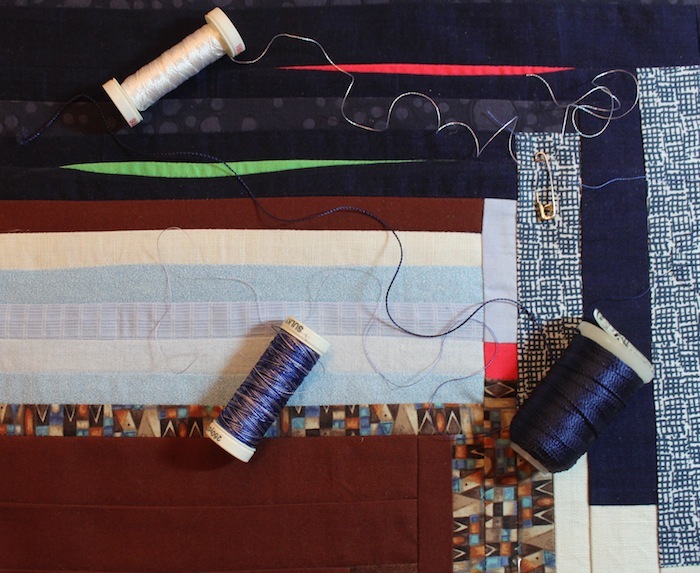 This challenge quilt for the Toronto Modern Quilt Guild had me stumped. I discarded my original design idea: a Greek key design. One of the sketches I drew had a diagonal line from the left side of the page creating a sort of perspective. I liked the idea of creating depth in the piece by using colours. If I divided the colours I had selected into light and dark I could maybe create this illusion. These ideas brought to mind a couple of quilts I saw at QuiltCon this past February. 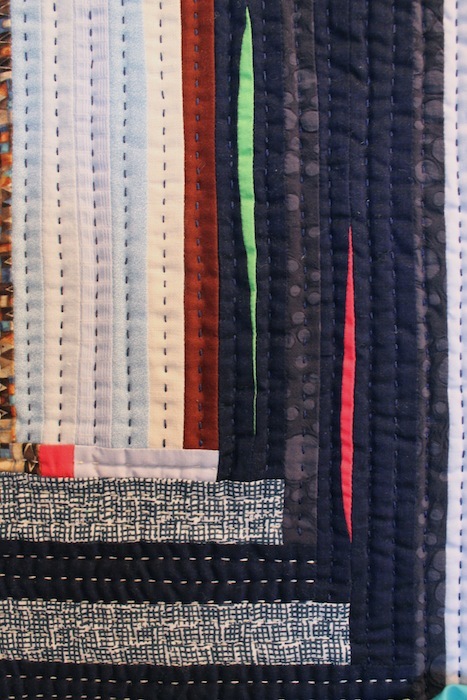 Chawne Timber of Completely Cauchy has created a series of log cabin style quilts based on her family history. In Anniston is a beautiful quilt that really captured my imagination when I saw it in person. Chawne used hand dyed indigo for the dark logs and various shades of cream for the light logs as well as some reds and green logs as accents. The placement of the light and dark logs emphasize the dark side of the log cabin. It really seemed to be in shadow. Chawne’s pieces were very tiny, creating a lot of depth and movement. So, I thought that using the log cabin block would let me create the idea of depth and perspective. 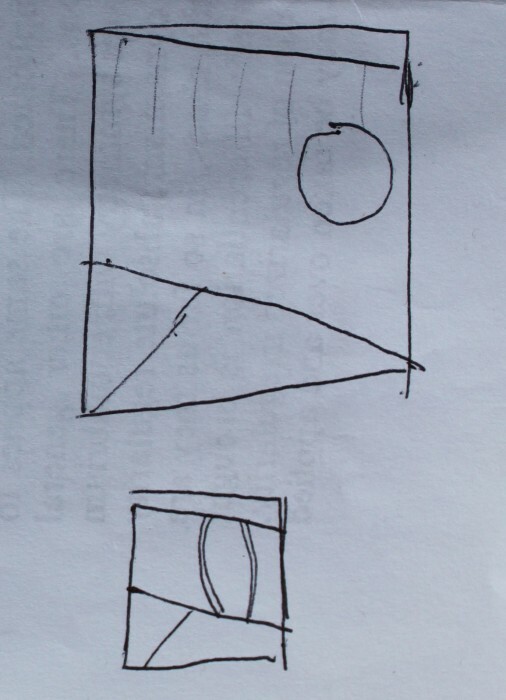 I did a rough sketch of the design above. I wanted to vary the width of the logs and used both half inch and one inch finished logs. This quilt is not pieced in the traditionally method, rather I pieced sections of strips together and then attached these as a unit. I cut the navy solid and print in one inch finished strips to emphasize the idea of steps leading in towards the centre. There is a tiny bit of green and coral the inspiration photograph. 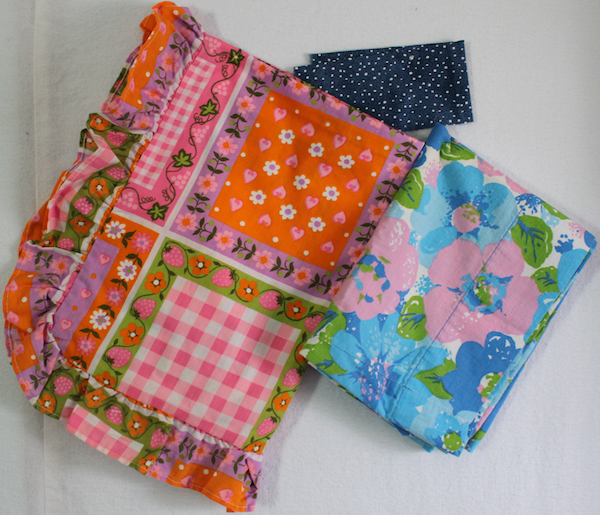 I used Jean Well’s technique of narrow insert piecing to add these bits of colour. I love the way they pop out of the dark blues. Log cabin quilts symbolize hearth and home, security and stability. The centre is usually red to reflect the fireplace that was the centre of the home and the light logs represented the side of the home facing the sunshine, while the dark faced the shadow. My inspiration photo was a couple embracing in their bedroom with the closet in the background. Truly an intimate and safe place. I decided to hand quilt this piece and auditioned a few different threads including a rayon perle and a variegated sulky. In the end I hand quilted with the dark blue and white rayon perle thread. I really like the strong linear quality the stitches gives to the piece. I am happy to announce that this quilt was chosen as the winner of the Not Quite President’s Challenge. As well as the fabulous ribbon made by Becky, I received a one year membership to the Textile Museum of Canada! The Toronto Modern Quilt Guild does not officially have a president. Rather two of our members, Rebecca and Andrea are acting as co-presidents. They have been doing a fantastic job in organizing our growing guild. This year they decided to host the Not Quite President’s Challenge. All the members were given a magazine, told to go to page 25 (there were 25 members at that particular meeting) and use that page as inspiration to create a small quilt. The ad pictured above was on page 25 of my magazine. Anything on this page could be used as inspiration: the colours, shapes, words, anything! The quilt could have a maximum perimeter of 60″ and could be made using any technique. I was really attracted to the Greek Key design in the rug shown in the picture. I started to piece this block using a warm rich brown and cream. After spending a bit of time making what you see above, I decided I didn’t really like where the design was heading. 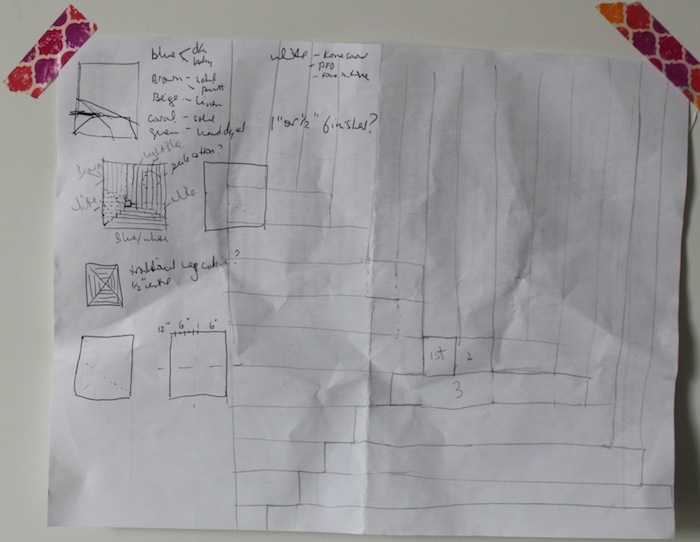 I sketched a few designs on a piece of paper and also wrote down some key words from the photo. 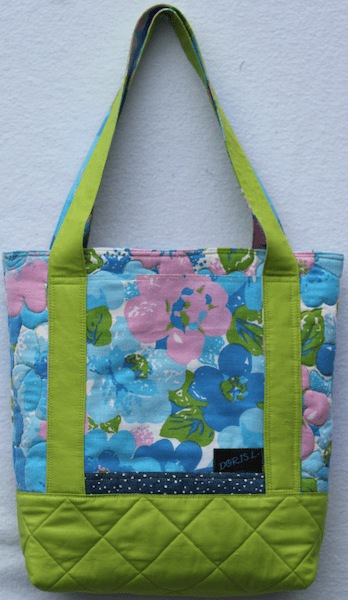 The colours include: brown, navy, white, green and fuchsia. The designs include: greek key, piping, curved light (fixture), lines both horizontal in the rug and vertical in the hanging clothes and the two people. I wanted focus words to help me plan the quilt. 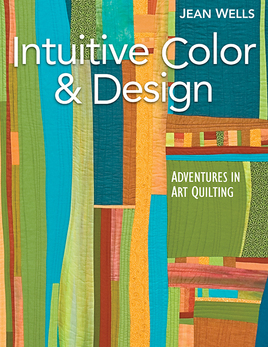 Intuitive Color & Design: Adventures in Art Quilting by Jean Wells. I remembered Jean Wells’ book: Intuitive Colour & Design and read it again for inspiration. The chapter: Color Through My Eyes was especially helpful in deciding on a palette of colours. One of the assignments in this chapter deals with proportion. In this assignment you: 1) choose a colour source for inspiration – the ad; 2) write down the colours from your inspiration – the sketch above; 3) give each of the colours a percentage rating so that you can see how much or little of that particular colour is represented; 4) go back to the inspiration and look again carefully, make note of any background or dull colours you may have missed the first time. 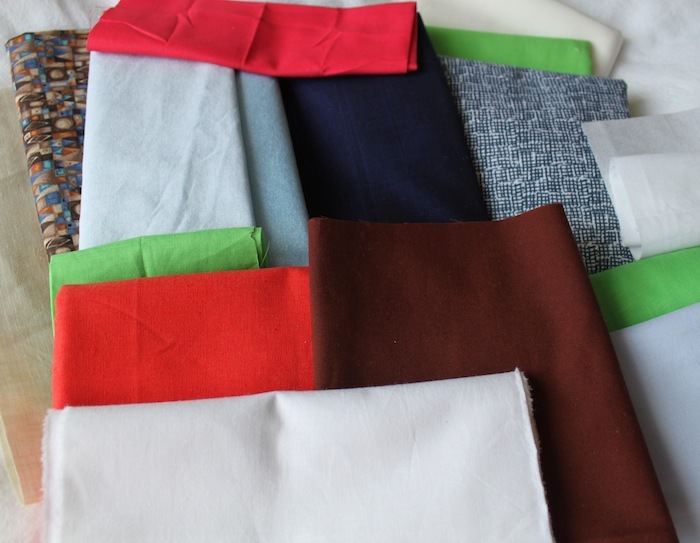 The photograph above shows the fabrics from I pulled from my stash. I don’t have them organized by proportion yet. After my initial selection I added the two light blue pieces. One of the design elements I really like from the photo is the crispness of the piping on the chair. I also like the fine narrow lines of the piping and the light fixture. 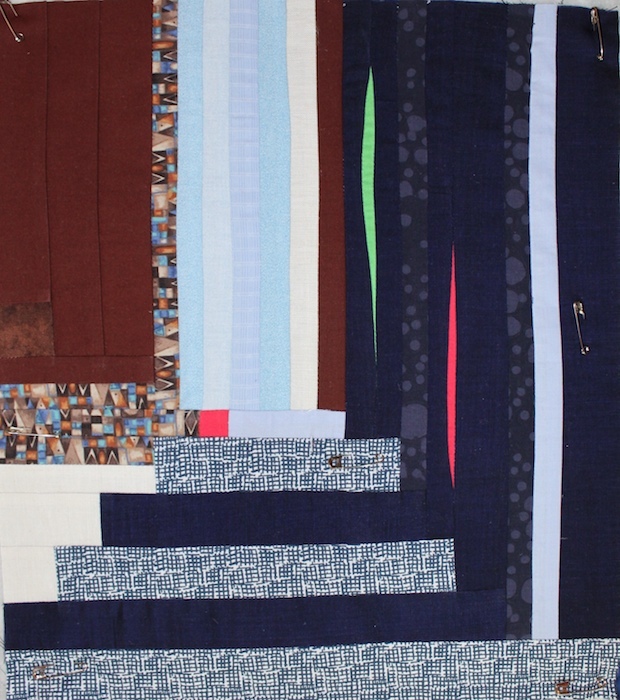 I want to include these elements that Jean calls: narrow insert piecing. I don’t have many solid white in my stash, but found these tone-on-tone whites. I don’t know if I will use them, I may add a few more or eliminate some fabrics as I begin to work. 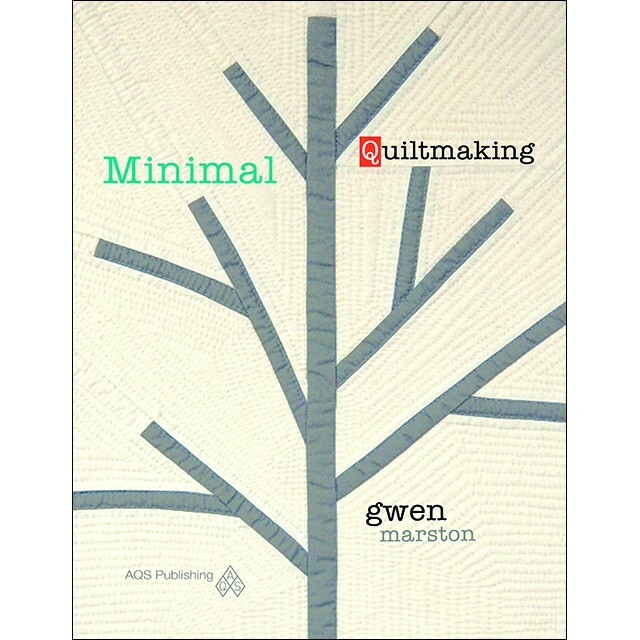 I was inspired to create another President’s challenge quilt after reading Gwen Marston’s new book: Minimal Quiltmaking. I love the quilts in her book, they look simple and spare, yet the designs are powerful. There is something very interesting going on in each quilt. Sometimes it is the colour combination used like in: Turquoise on page 47. There are only four colours but the composition makes the quilt glow! Other quilts have a very strong graphic quality, like: Winter Beech on the cover above and on page 56. Gwen has distilled the idea of a tree into its simplest form. Spring is the challenge word and bright green grass sprouting through snow was the image that came to mind. 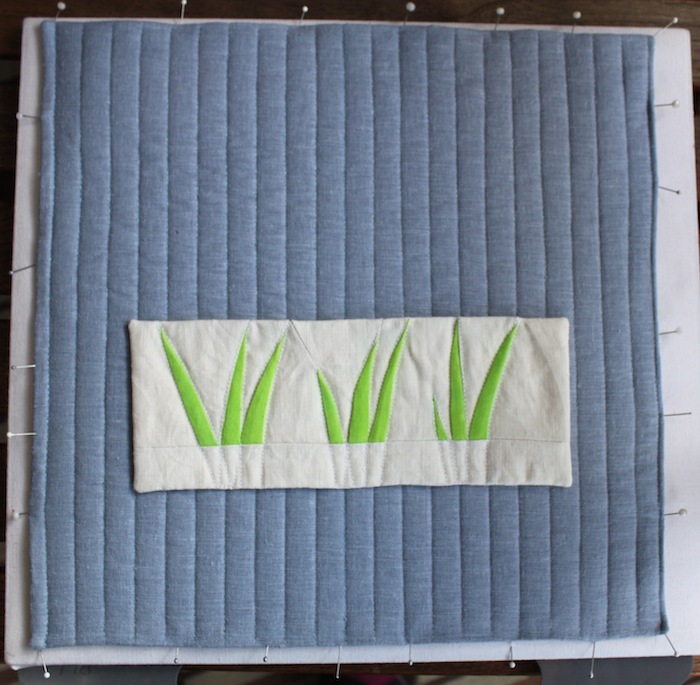 I wanted the grass to be a small rectangle floating on top of a 12″ quilted square that would act like a mat. I roughly sketched out the different grass shapes on paper so that I would get the proportions correct. 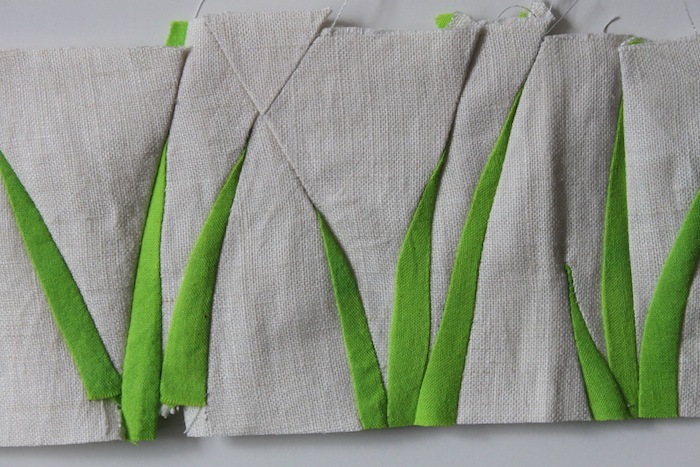 The finished grass piece needed to be about a 3″ x 9″ rectangle. Hand dyed green cotton was improvisationally inserted into white linen. I started piecing from the left side, cutting and inserting and pressing as I went along. I auditioned the grass strip on a 12″ square, trimmed the top and bottom and added a 1/2″ strip along the bottom, this was the snow that still covered the ground! 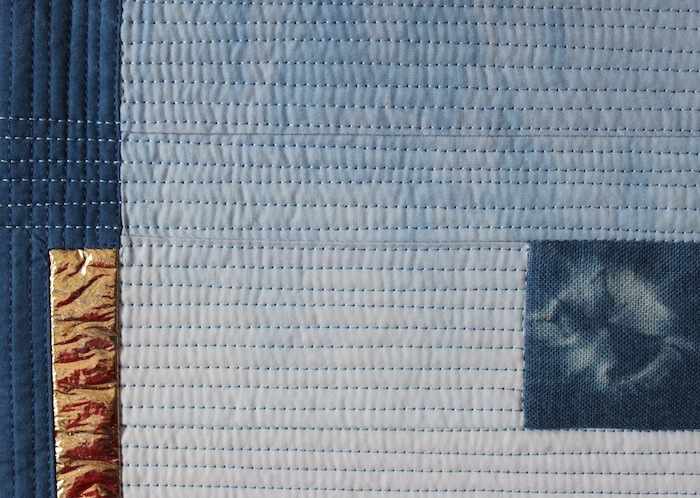 The blue/grey linen square was finished using the pillowcase technique and then machine quilted with a walking foot. I used a lovely metallic mauve thread to quilt the lines. 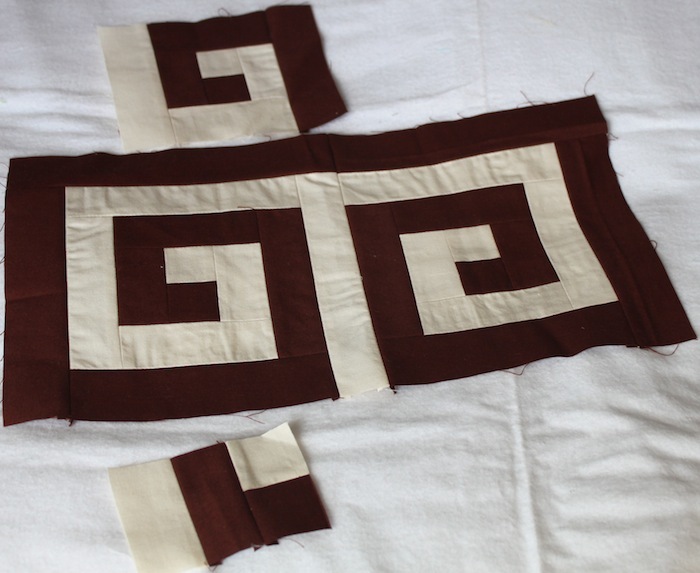 Even though I cut the square so that it would be 12 1/4″ finished, the quilting process shrunk the top a little. 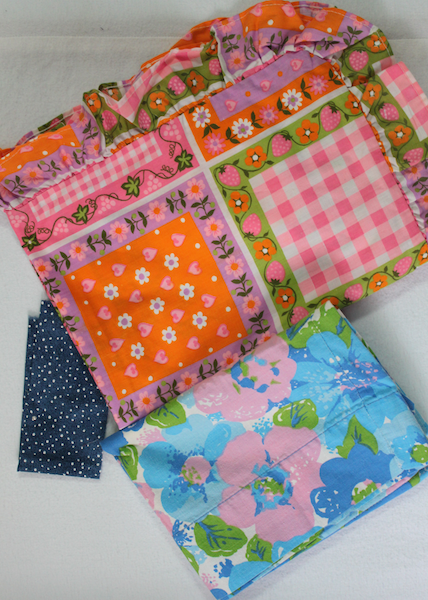 Next time I think a scant 12 1/2″ square would be better (bigger if the quilting is denser). 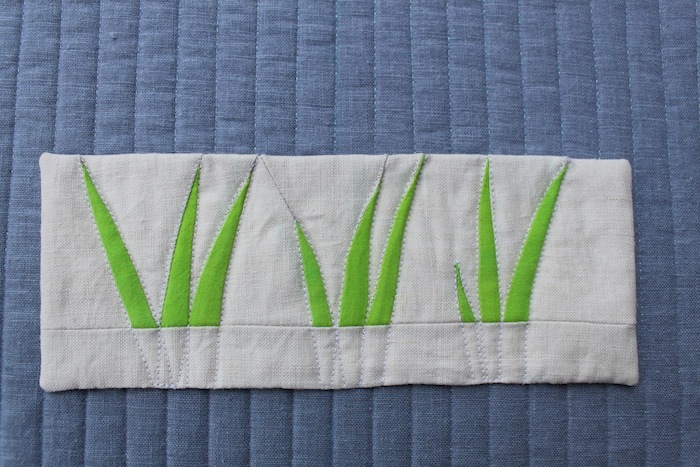 The grass piece was also finished using the pillowcase technique and then hand stitched on top. Blocking the quilt was necessary to make the piece square and flat. The finished size is about 11 3/4″. I am very happy with this quilt. Creating a minimalist piece is more difficult than you might imagine. While I was working on the quilt, I would constantly ask myself whether I could eliminate anything from the design and still maintain my vision. 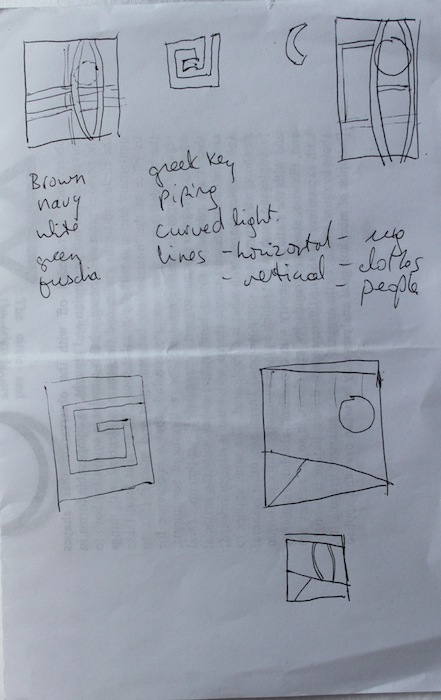 What were the very basic elements of the design that needed to be included in order for the quilt to work? It was this constant dialogue that helped me throughout this process. 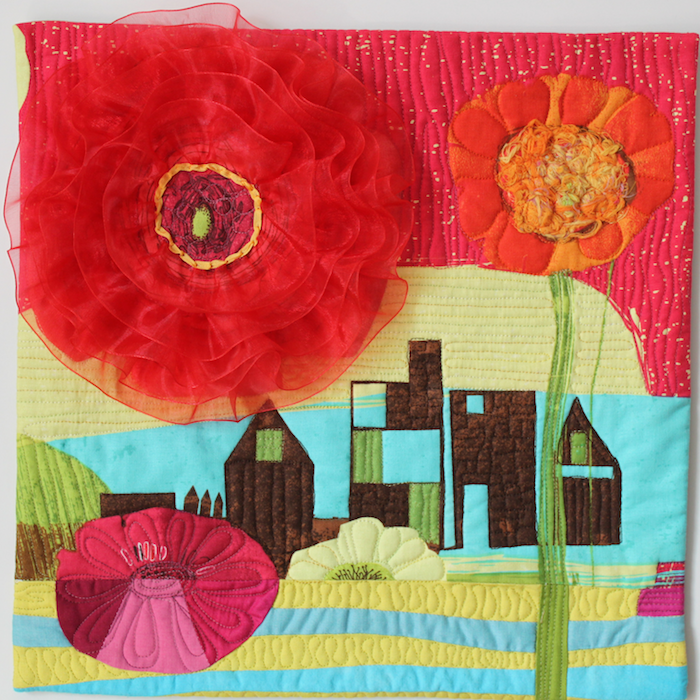 Spring in the City – President’s challenge quilt 2015 completed! 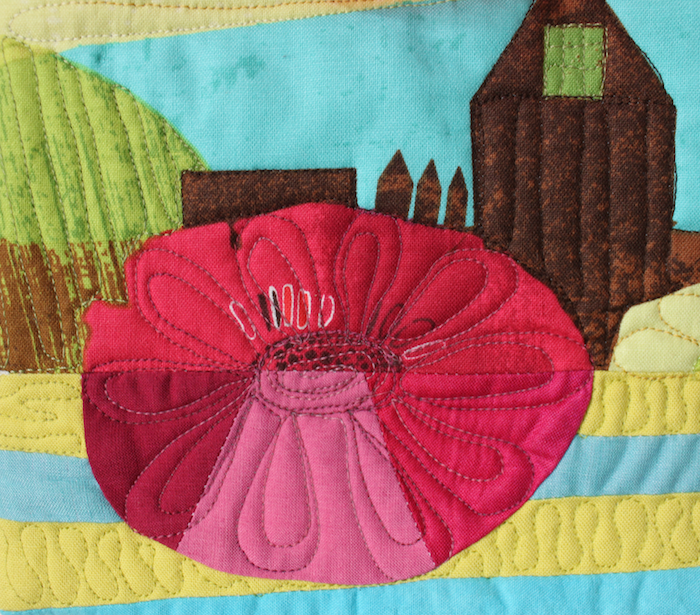 I’ve completed the Yorkshire Rose Quilters’ Guild of Toronto President’s Challenge ahead of the deadline. I really enjoyed quilting and embellishing this piece. 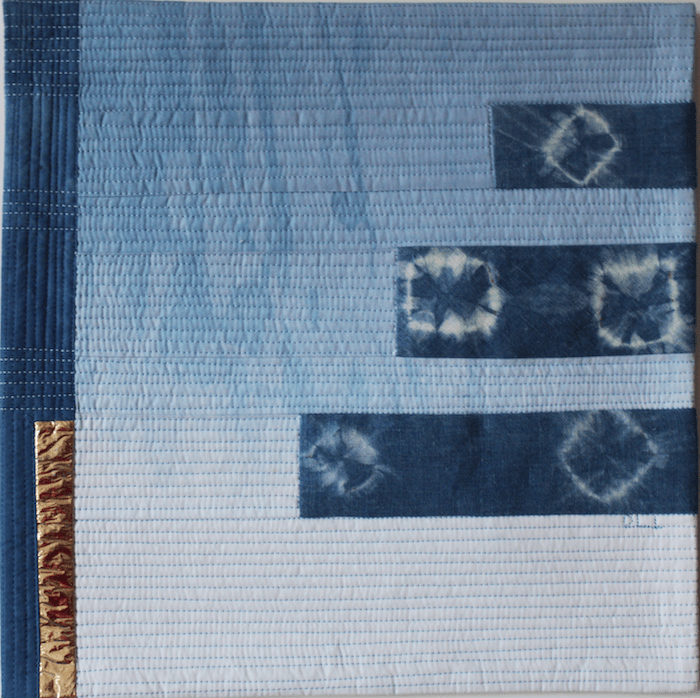 This miniature quilt finishes at 12″x12″. I free-motion quilted densely in some areas, leaving other areas unquilted. 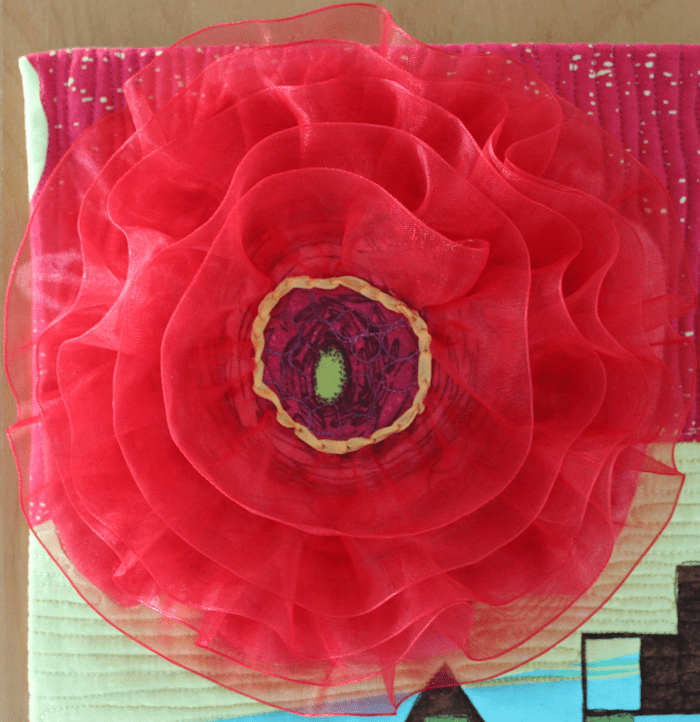 The large red flower at the top needed some embellishment. Red organza ribbon that had beautifully wrapped a gift was perfect. 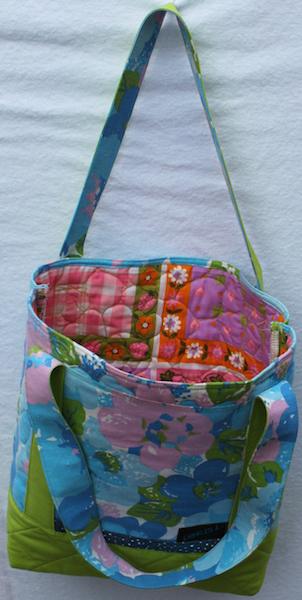 I gathered the ribbon and quilted it into place with a zig-zag stitch. The center of the flower was outlined with a row of yellow silk ribbon. It nicely finishes the edge and draws the eye to this focal point. 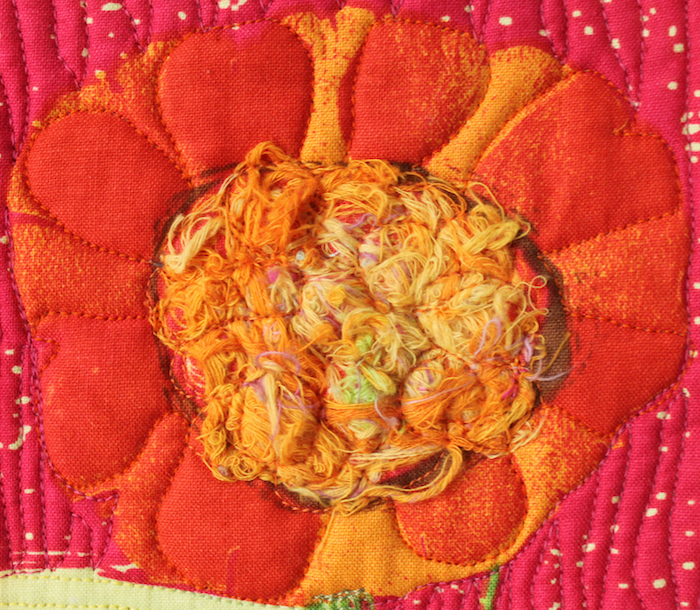 I added some hand dyed thread to the centre of the orange flower and quilted them into place. 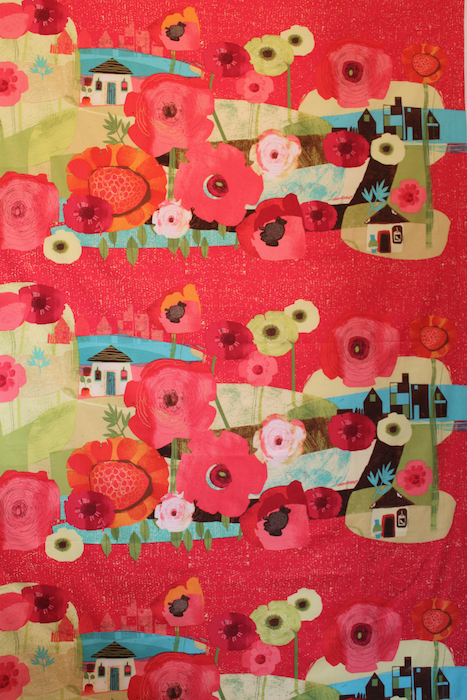 The beginning of quilt started with this fabric: Always Blooming by Susy Pilgrim Waters. I can see so many more possibilities with this fabric. I will be bringing Spring in the City to our next meeting for show and tell. How many of you are finished your President’s challenge? 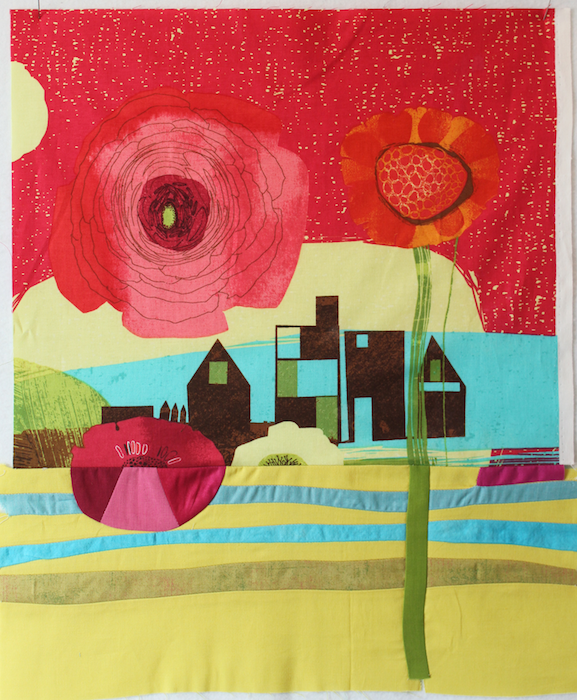 The president of the Yorkshire Rose of Quilters’ Guild of Toronto has issued a challenge! 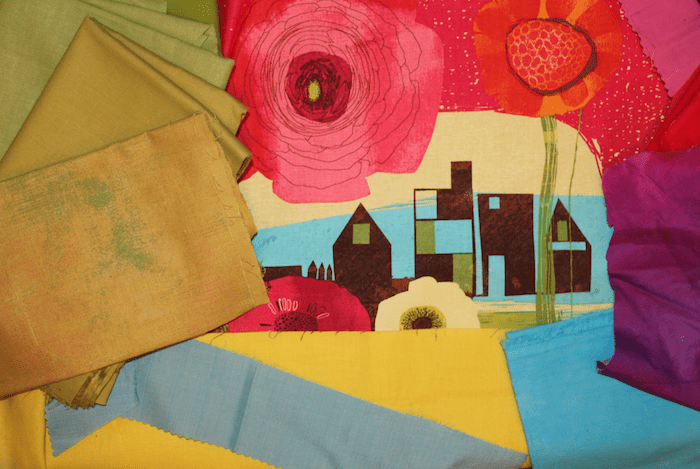 We are to make a 12 in square quilt using the world Spring as inspiration. 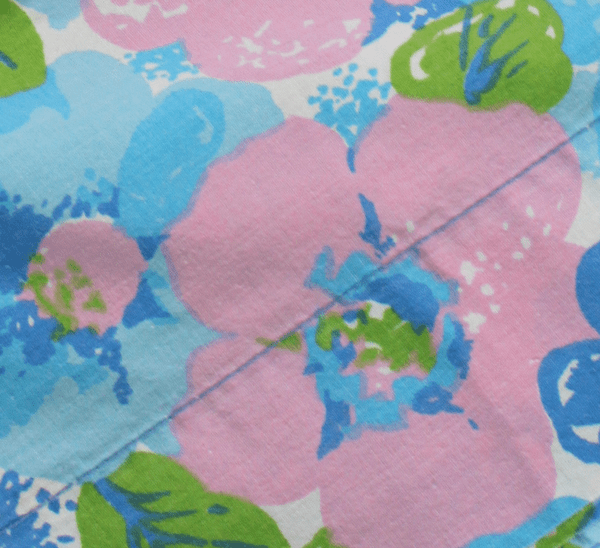 I selected a beautiful fabric I purchased from Country Clothesline online store. Sylvia the owner has a wonderfully curated shop. 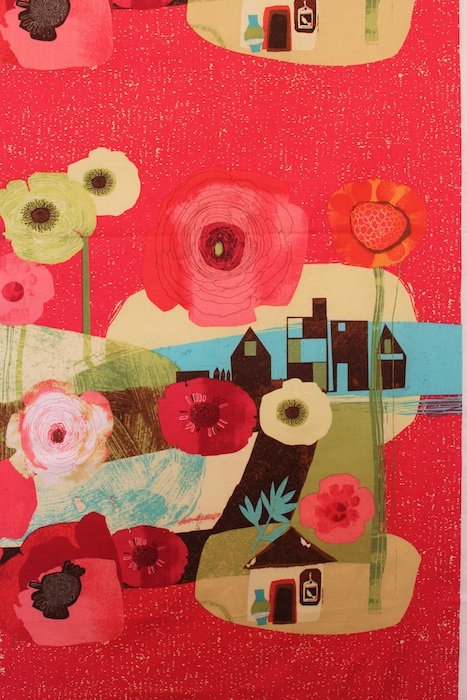 I was attracted to the large scale print and bold colours of Always Blooming. It came home with me even though I didn’t know what I would do with it. When the President’s Challenge was issued and the inspiration word spring was announced, definitions of the word were given to expand our ideas beyond the obvious. I must admit that the season was the first thought I had. Later, I looked up spring in the dictionary and thesaurus for inspiration. I wanted to create something beyond the obvious but when I looked through my stash and came across this piece of fabric, I knew I had the beginning of my quilt. I isolated a small section of the print and pulled a selection of fabrics from my stash. As you can see below the piece is a rectangle, I inserted too many strips. The piece only needs to be 12 inches square when completed. I will be doing a bit of quilting, so that will shrink the quilt a bit, but I will need to crop off some of the outside edges. I’ve pieced the top and the next step is to quilt it. I plan on adding some embellishments, such as organza ribbon and maybe some beading. This challenge is due in May more work is needed before its done! The outgoing president of the Yorkshire Rose Quilters’ Guild of Toronto issued a challenge to the guild: make a manhole cover quilt! Guild members were challenged to create a circular quilt the size of a manhole (around 24 1/2 inches) to celebrate Toronto. The design and technique were left up to each individual. My entry into the President’s challenge is created using a mosaic technique. I selected a variety of colourful scraps, ironed a fusible web onto the wrong side, cut the scraps into 1 inch squares and arranged them onto a solid grey. I arranged them in a curved pattern, fused them to the background. Each square was machine stitched 1/8 of an inch around the edge. 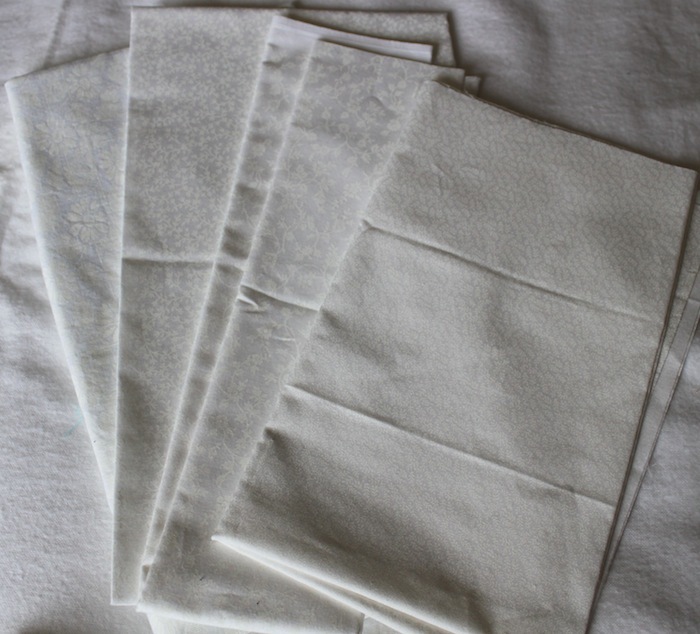 The backing and batting were attached using the pillowcase technique. I under stitched around the perimeter, which helped to keep the backing fabric rolled towards the back. Each section was machine quilted in a curved spiral. 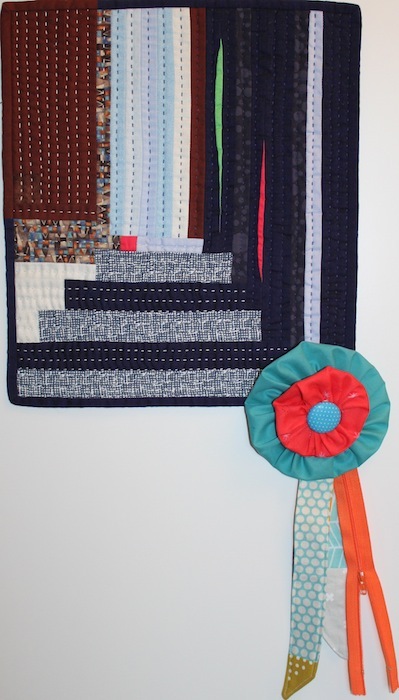 All the quilts from this challenge will be on display at our quilt show Sept. 20-21, 2014. Visitors to the show will vote for their three favourites and the top three will be unveiled at our October meeting. 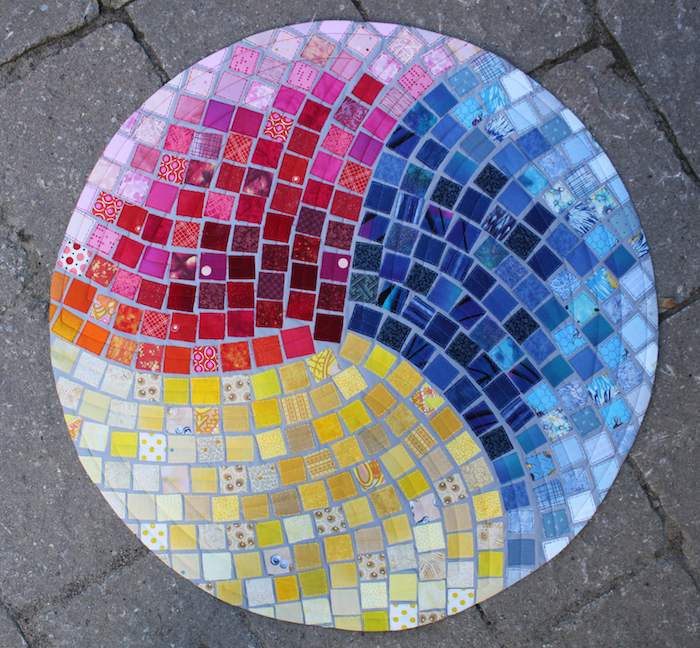 Toronto has been called a “Cultural Mosaic”. Almost half of the over 2.8 million people living in Toronto are immigrants. They speak over 140 languages and dialects. 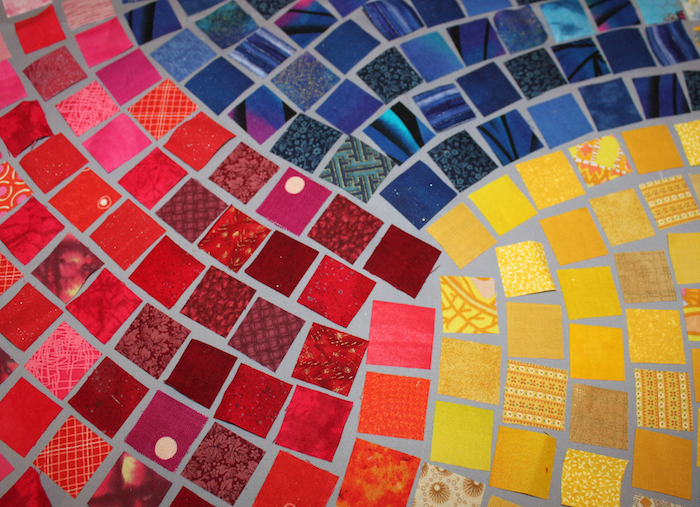 This quilt celebrates the diversity of Canadians that comprise our city. 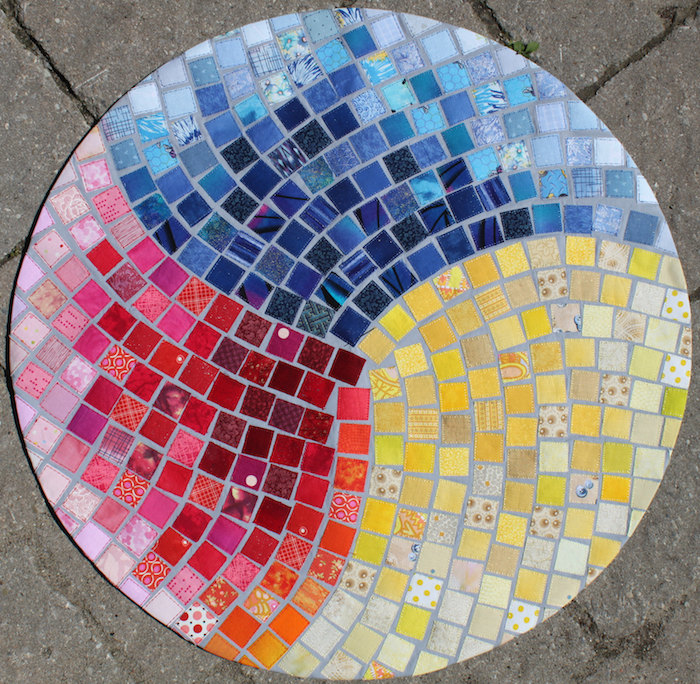 The squares of the mosaic represent the more than 200 distinct ethnicities that make up Toronto. 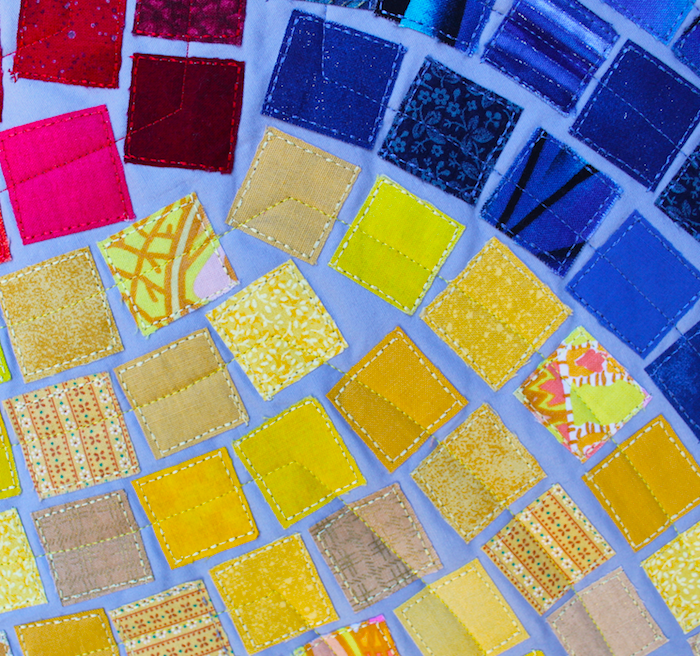 The quilt is a swirl of three primary colours, some squares are solids while some are a combination of colours. They symbolize the people of Toronto, all Canadians while still maintaining their rich ethnic, racial and linguistic heritage. We are fortunate that all the ethnicities have retained their uniqueness, contributing to, and strengthening the fabric of our community. The motto for the City of Toronto describes our rich culture: “Diversity Our Strength”.